Throw out your timers! Don’t babysit your blots again! The Freedom Rocker™ BlotBot® is an automated blot processor for incubating and washing blots and gels, after the transfer from gel to blot. Using a microprocessor for precise timing and dispensing, it automatically processes Westerns, Northerns, and Southerns in a consistent manner, every time. Ideal for unattended staining of gels, it frees you from babysitting your samples. Simply add your buffers and reagents, and the BlotBot carries out your existing protocol. Plan your next experiment over coffee, not lunch. Process blots unattended so you can focus on other tasks. Use as little as 3.5 mL of antibody (or up to 50 mL of reagent) for each mini blot, and recover separately. Large color LCD display for easy programming of protocols. Are you chained to your timer? Throw it out and use the Freedom Rocker BlotBot. Simply place your blots, gels, or slides in trays, set the program, connect the bottles/tubes of reagents and walk away. The microcontroller in the Freedom Rocker BlotBot will ensure that the reagents and washes will be accurately pumped into and out of the trays at the precise times. Results will be consistent because all trays will receive the same reagent or wash buffer at the same time in equal volumes. 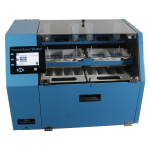 Multi-dispense models can even dispense one different reagent to each tray, i.e. primary or secondary antibody. Be productive and concentrate on another task, enjoy your lunch, OR let it run overnight! 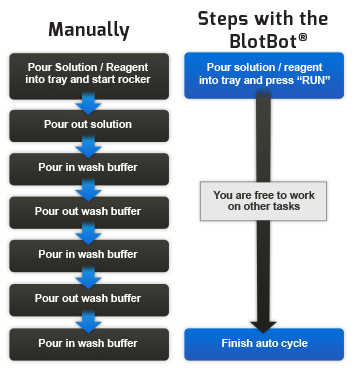 Consistent automated blot processing with the BlotBot. Western blot analysis of extracts from human squamous carcinoma cells using anti-myc antibody. Courtesy of Dr. Aparna Ranganathan, the University at Albany (SUNY). 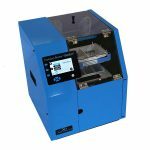 By automating the processing of blots and gels, the Freedom Rocker BlotBot yields very consistent and accurate blots, gels, and slides. 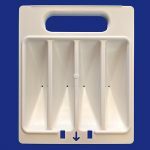 It automatically dispenses and aspirates equal volumes of reagents from multiple trays simultaneously. The samples in all the trays will experience the exact same protocol. Complete the testing portion of your research project in half the time. Blots are ready when you arrive at work. You can review them over coffee, not lunch, so you can start your next test iteration the same day. Automatically processing blots and gels cuts down on distractions. Instead of babysitting your blots you have more time to focus on other tasks, eat lunch, or attend meetings – or let it run overnight. Through increased productivity, the Freedom Rocker BlotBot pays for itself in about 30 uses. The Freedom Rocker BlotBot replicates your existing protocols. There is no need to develop new protocols so you can start processing right away. The Freedom Rocker BlotBot comes with a 30 day money back guarantee and a 2 year warranty. Customers have been using Freedom Rockers since 2005, and most of those sold in the first years remain in use today. Download the Freedom Rocker™ BlotBot® brochure. Portion of a sample protocol – showing the addition and washing of one reagent using the Freedom Rocker BlotBot. The Freedom Rocker BlotBot can be programmed to perform up to 3 of these reagent steps, and process your Western blots and gels unattended. Your blots can be ready to analyze when you arrive at work the following morning. Unattended dispensing and pouring off of liquids. Only requires an electrical outlet – no vacuum, pressurized air or gas, or additional pumps required. Can recover reagents, such as antibody solutions, separately from each gel or blot. 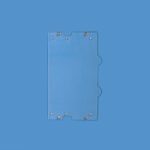 Trays can hold mini blots (maximum dimension 8cm x 8cm) and midi blots (maximum dimension 8cm x 16cm). Rocking continues after the final rinse and the wash buffer remains in the trays to prevent the blots or gels from desiccating. Uses existing protocols. Programming is easy and follows standard protocols steps. Programs can be up to 9 steps where each step is an immersion in a reagent (e.g. antibody) or a series of washes. In each step reagents or buffer will be dispensed and aspirated to all the trays simultaneously, for consistent processing of all the blots and gels. The minimum volume required to fully cover each mini blot is 3.5 mL. 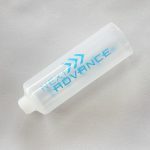 A clearing rinse can be activated to provide a quick rinse to get the final drop of reagent after each wash or reagent immersion. The removable trays can be washed. Replacements can be ordered separately. A bottle of buffer is connected to the Freedom Rocker BlotBot with a hose and leak-proof quick-connector connections. 1. Use very small volumes of antibody solution. Similar to blots in a rolling bottle, a small puddle of antibody passes repeatedly over the blot in curved bottom trays. Reagents from each blot are captured in 50 mL tubes, ready for storage. 3. Use your existing protocols. Each program step matches each step in your protocol. For example, a 3X 10 min. buffer wash is a 3X 10 min. buffer wash. No development effort required. 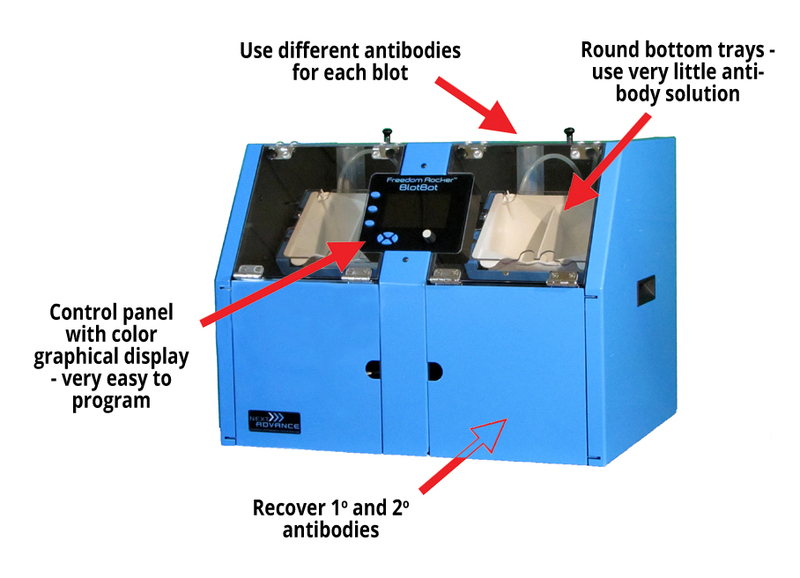 Place your transferred blot and reagents inside the BlotBot. 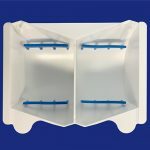 Add your blot to the curved rocking tray, blocking buffer to the tray with the blot, wash buffer to the buffer bottle, and antibody solutions to the reagent tubes. Run a program. Either edit a program or run an existing program. You can use whatever protocol you normally use, up to nine steps. See the Programming tab for more details. Press play. 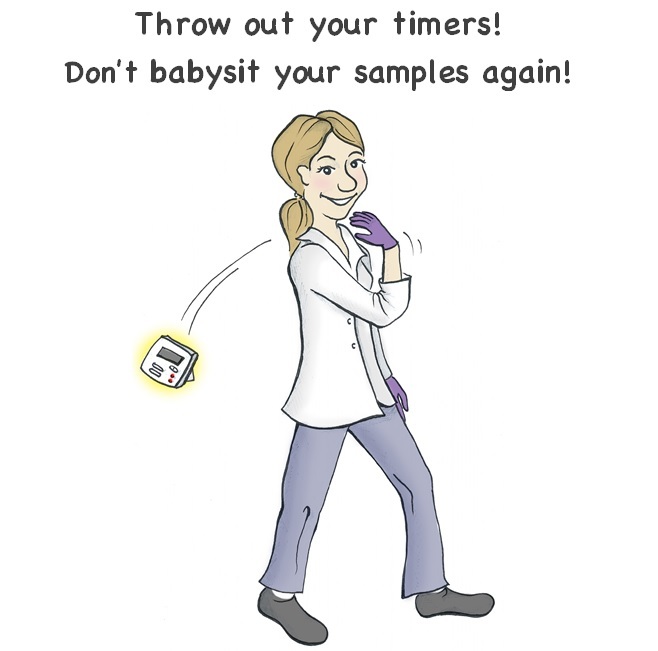 Your blots or gels will be processed without any babysitting! From the home screen, select “Programs”. Select one of the programs using the dial, and press the “Edit” button to edit the program. The BlotBot comes with 8 programs with default values. Choose a name for your protocol. The “Save” button saves changes, while the “Continue” button moves on to the next screen. 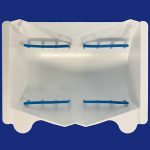 Select whether the protocol will be used with a mini blot tray (2 chambers with a central divider), or a midi blot tray (one large chamber). Now, choose whether you want a clearing rinse to be included in the protocol. A clearing rinse will briefly rinse the blot with 10 mL of wash buffer at the end of each step. Select the speeds, times and reagents for each step in your protocol. When selecting the reagent, you can choose the following: “Buffer” from the buffer bottle; “1” or “2” from the reagent tubes; and “END” to indicate that there are no more steps. Buffer wash steps can be repeated up to 10 times; reagent steps cannot be repeated; reagents can be recovered. 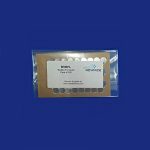 Because blots and gels should be kept wet, the first step assumes that there is liquid, such as a blocking buffer, in the tray, and after the final step, the buffer (or reagent) will remain in the tray, and the tray will continue to rock slowly. Press “Save” to save all of your changes. Can the Freedom Rocker BlotBot work in labs in other countries? Yes. A wall transformer will convert the voltage from your wall outlet to 12V DC for the Freedom Rocker. Select the proper voltage when you order your instrument. How much room does the BlotBot require? 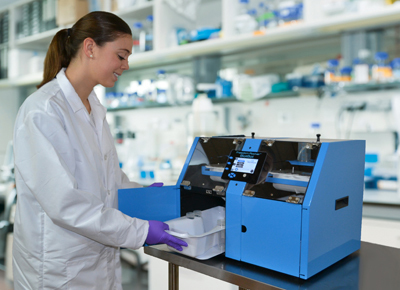 The BlotBot 120 requires 18 inches (45 cm) of lab bench, model 240 requires 23 inches (56 cm). 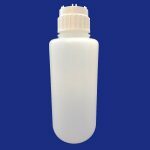 The bottle for wash buffer can be placed behind or to the side of the BlotBot, or even on a shelf above or below the lab bench. What is the minimum volume of reagent or antibody required? Only 3.5 ml of antibody is required for a miniblot. How do I switch between mini and midi size gels or blots? 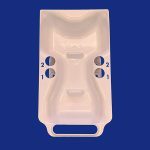 The BlotBot comes with separate trays sized for mini and midi blots and gels. Simply use the appropriate tray and set the blotsize in the program. What happens at the end of the final wash step? After the programmed duration of the final wash step, the rocking continues with the wash buffer in the tray(s). How many trays can the BlotBot run at once? The BlotBot 120 can run 1 midi or 2 mini blots or gels at a time. The BlotBot 240 can run 2 midi or 4 mini blots or gels at a time. Do all the trays follow the same protocol? Different reagents can be dispensed and collected from each blot or gel, however, the timing of each step and the volume of buffer in each wash step will be the same. Can I dispense and recover different antibodies into each tray? Yes, you can dispense different reagents for each blot, and the reagents can be recovered separately.